Beech jointer plane 22" lg x 3" w. Double iron. "Z PHILLIPS PAT 1870" cast on throat. The D’Elia Antique Tool Museum is located in Scotland, Connecticut, and has on display Andrew D’Elia’s Collection of Antique Woodworking Hand Planes. 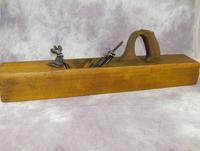 Andy’s extensive collection has many examples of patented transitional planes from 1820 to 1940 featuring inventors such as Knowles, Holly, Loughborough, L. Bailey, Rodier, Worrall, and many other rare inventors. All of the antique planes were acquired by Andrew D’Elia over the last 35 years. The collection consists of rare Stanley, Sargent, Connecticut plane makers, and a number of Dutch and English planes. Also on display is a collection of rare 18th century wooden planemakers such as F. Nicholson, Chelor, I. Nicholson, I. Jones, Jo. Fuller, Jn. Tower, and others. The museum is approximately 1,000 square feet and is located in the Scotland Public Library building. Over each of the museum’s five windows are unique stained glass panels depicting a number of rare woodworking planes. The collection of patented planes is probably the most ever assembled in one place. A number of the patented planes are represented in great depth. A visit to the D’Elia Antique Tool Museum gives one the opportunity to study a large number of woodworking planes all in one location.